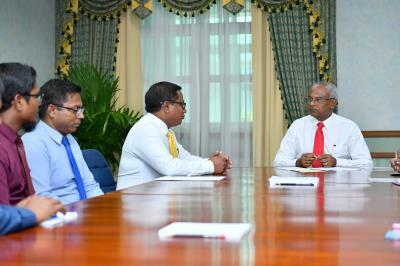 President Ibrahim Mohamed Solih has today met with members of the Ukulhas Island Council of North Ari Atoll. At the meeting held at the President’s Office this afternoon, members of the council briefed the President on their plans for the development of Ukulhas Island, and the economic endeavours ready to be undertaken. Members especially highlighted the preliminary work underway in the island in preparation for the International Conference on Artificial Intelligence to be conducted by the University of Bradford in the island, from 26 to 28 August 2019. Speaking at the meeting, President Solih lauded the island council for their efforts being put in for the betterment of Ukulhas, and encouraged the council to be empowered and to further their initiatives.